Hajj Stampede: Nigerian death toll rises to 145 with 35 injured & 165 still missing. 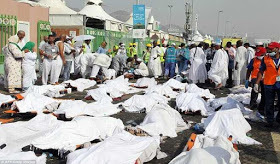 The National Hajj Commission of Nigeria (NAHCON) on Sunday, October 12, confirmed that 145 Nigerian pilgrims died in the September 24 stampede in Mina, Saudi Arabia with 35 injured and 165 still missing. Over 1,400 people over all have died. ...and the update on the stampede with the Chargé d’Affaires, Nigerian Embassy in Riyadh, Ambassador Tijjani Hammanjoda and the Nigerian Consul-General to Saudi Arabia, Ambassador Ahmed Umar. He said that of the 42 Nigerians injured, seven remained admitted in hospital and were responding to treatment. Following the discovery of more bodies of the pilgrims, the number of those earlier declared missing had reduced from 214 to 165, Okenwa added. The Commissioner of Operations of the commission, Alhaji Ibrahim Modibbo Saleh, said 29 of the 145 deaths were from the tour operators,19 males and 10 females. Of the 76,000 Nigerians who performed the pilgrimage, 40,850 has been transported back to Nigeria. While fielding questions from newsmen, the Chairman of the commission, Alhaji Abdullahi Mukhtar, said that the Nigerian mission in Saudi Arabia would continue to monitor the seven injured pilgrims still on admission at various Saudi hospitals even after the Hajj operation. "We have consistently been monitoring them; the Nigerian mission in Saudi Arabia will continue to monitor them after the hajj operation until they are discharged," he said. The chairman also debunked the rumour going around in Nigeria that the deceased were buried en masse. He said that the Saudi authorities took finger prints of the deceased and that DNA tests would be conducted on mutilated bodies to ascertain whether those declared missing were dead or alive. "Blood samples of the deceased pilgrims already in Saudi Arabia were taken while that of those who do not have immediate members of their families here will be taken in Nigeria and transported to Mecca for the test," he stated.